The latest news to come out of Egypt reminds me of a Road Runner Cartoon in which Wylie Coyote always ends up shooting himself, blowing himself up or otherwise ending up in a smoking crater. Remember the start of the swine flu epidemic? When news of it hit Egypt, the government sprang decisively into action, slaughtering and destroying thousands and thousands of pigs belonging to Egypt's Christian minority. In Egypt, particularly in Cairo, garbage collection is handled by Coptic Christians, who eke out a living from extracting metal and paper that can be recycled. Many of the Christian garbage collectors live in crowded, smelly neighbourhoods where they consider it a blessing to be free of Muslim harassment. One of the ways Coptic Christians made their living was to feed some of the garbage they collected to their pigs. This provided them with meat at low cost and it kept the city clean. It was a win win arrangement until religious intolerance donned the garb of junk science. When the decree was enacted to slaughter the pigs belonging to the Christians, there were unforeseen consequences. The Guardian reports as follows on the unforeseen consequences of the Egyptian government's stupidity. According to government figures, about 300,000 pigs have been slaughtered since the culling began in May, and now streets in Cairo are filled with the rubbish that had previously been collected by the city's zabaleen, or garbage collectors, to feed to their pigs. Too late, the government has seen the problem. In fact, everyone has seen the problem, literally, as piles of garbage accumulate on the streets. The zabaleen had been the country's main clean-up crew for decades, living in shantytowns on the outskirts of the city. But with their pigs gone, there is no need for them to pick up the organic waste they had fed to their animals. The government has admitted that it overreacted. The environment ministry says there is a concerted effort to clean up the streets before other illnesses occur. But tell that to the millions of Egyptians who open their windows daily to the rotting stench of old food and throwaways. Was the Egyptian government's action motivated in part by an animus towards its Christians? It is hard to believe that this is not the case. But now the suffering that belonged solely to the Christians has now hit Egyptians of all faiths. 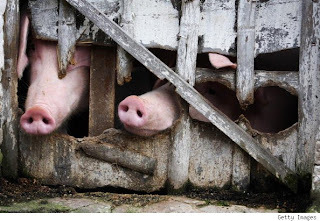 Perhaps pigs could be imported from abroad to help the Egyptians with their new sanitation problem and to relieve the economic distress of Egypt's Copts.